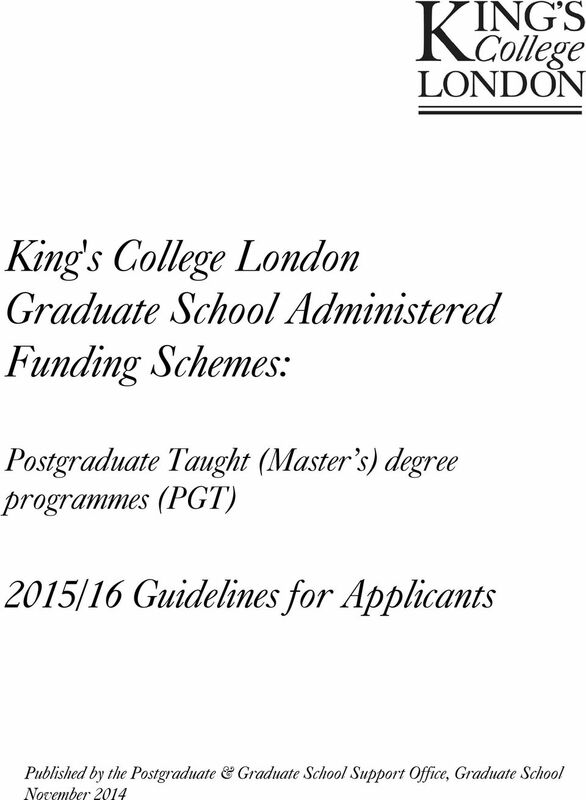 Download "King's College London Graduate School Administered Funding Schemes:"
3 INTRODUCTION About the Graduate School The Graduate School provides advice on a wide range of postgraduate funding opportunities and will, where possible, guide applicants to the most appropriate sources of funding for their degree programmes. The Graduate School also administers a wide range of funding schemes that are open to students in pursuit of a postgraduate degree at King s College London. 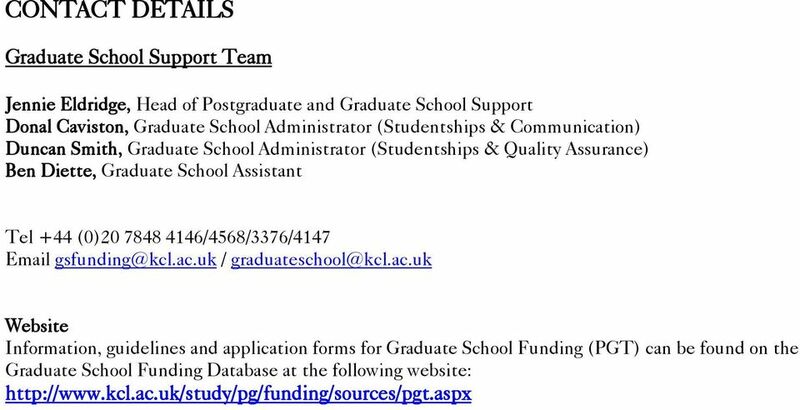 For more information about the Graduate School and what it does, please go to: About this Document This funding guidance document has been produced to provide information about some of the funding opportunities that are offered by and/or administered through the Graduate School for Postgraduate Taught (PGT) degree 1 programmes at King s College London for the 2015/16 2 academic year. PLEASE NOTE, the funds described in this document do not apply to MPhil/PhD research programmes, specialist doctorate programmes, PG Cert and PG Dip programmes. You will find a list of all the schemes covered by this document within the table on the next page; note that this is not an exhaustive list of all schemes covered by the Graduate School as the Graduate School is also involved with a range of external funding opportunities and college agreements. Within this document you will find details about the criteria, application process, and selection process for each of the individual schemes covered by this document. Also contained in this document are the full Terms and Conditions (see section Conditions & Regulations of Funding ) that will apply to all of the schemes listed. 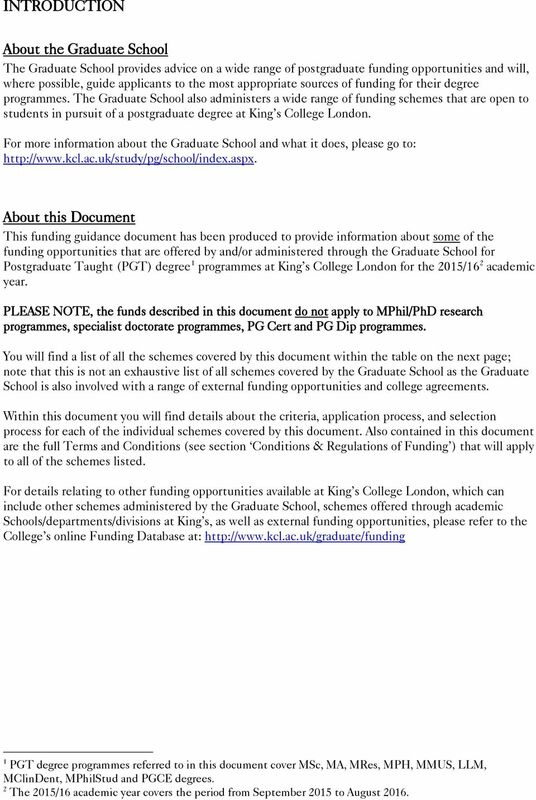 For details relating to other funding opportunities available at King s College London, which can include other schemes administered by the Graduate School, schemes offered through academic Schools/departments/divisions at King s, as well as external funding opportunities, please refer to the College s online Funding Database at: 1 PGT degree programmes referred to in this document cover MSc, MA, MRes, MPH, MMUS, LLM, MClinDent, MPhilStud and PGCE degrees. 2 The 2015/16 academic year covers the period from September 2015 to August 2016. 4 LIST OF SCHEMES COVERED BY THIS DOCUMENT Scheme Approx. number available Maximum value of award King s President International Scholarships (KPIS) 20 10,000 Canadian Friends Award for Masters Students (CAN) 1 1,000 Friends of King s College London Association Scholarship (USA) 1 $2,000 USD IMPORTANT Please note that each funding opportunity has specific eligibility criteria that must be met, and the application and selection procedure may also differ between opportunities so you MUST apply according to the procedures that are set. Applicants who do not follow the correct procedures will NOT be considered for the scheme(s) that they intended. Application deadlines are absolute and materials received after the specified time and date will NOT be accepted and the applicant will be considered ineligible. For further details about each scheme, please scroll to the relevant pages below. 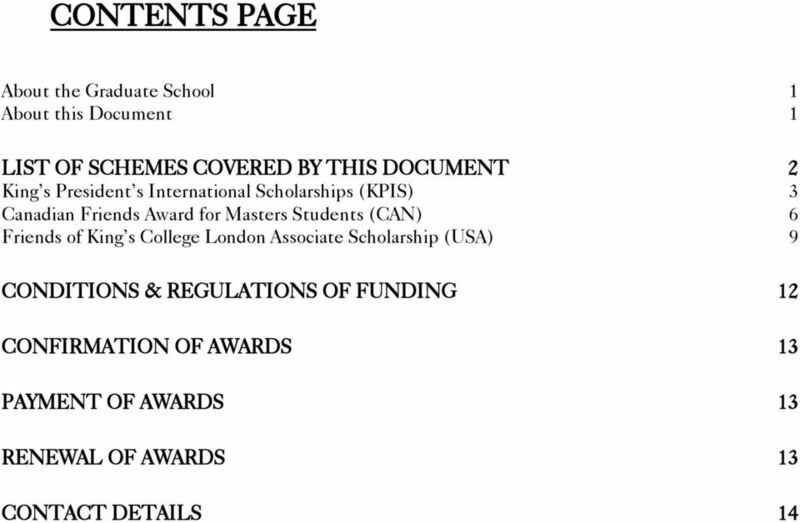 6 - King s President s International Scholarships (KPIS) - Canadian Friends Award for Masters Students (CAN) - Friends of King s College London Association Scholarship (USA) Details about each of these schemes are provided within this guidance document see relevant pages as indicated in the content page. Note that applicants must check their eligibility carefully before applying. Verification of eligibility will be conducted by the Postgraduate & Graduate School Support team once the application deadline has passed. Applicants only need to submit the PGT online funding form ONCE. Please refrain from submitting multiple PGT online funding applications to the Graduate School. As part of the Graduate School PGT online funding form, applicants will be asked to provide: - Personal details i.e. 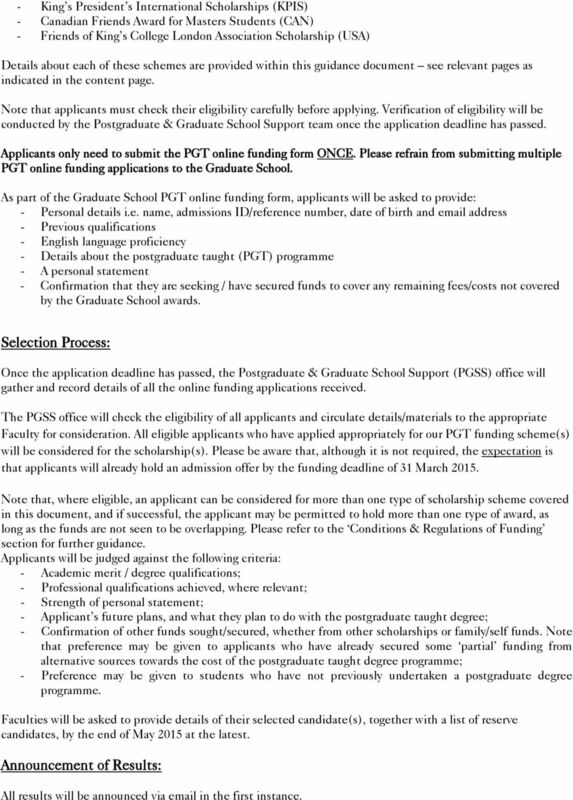 name, admissions ID/reference number, date of birth and address - Previous qualifications - English language proficiency - Details about the postgraduate taught (PGT) programme - A personal statement - Confirmation that they are seeking / have secured funds to cover any remaining fees/costs not covered by the Graduate School awards. Selection Process: Once the application deadline has passed, the Postgraduate & Graduate School Support (PGSS) office will gather and record details of all the online funding applications received. The PGSS office will check the eligibility of all applicants and circulate details/materials to the appropriate Faculty for consideration. All eligible applicants who have applied appropriately for our PGT funding scheme(s) will be considered for the scholarship(s). Please be aware that, although it is not required, the expectation is that applicants will already hold an admission offer by the funding deadline of 31 March Note that, where eligible, an applicant can be considered for more than one type of scholarship scheme covered in this document, and if successful, the applicant may be permitted to hold more than one type of award, as long as the funds are not seen to be overlapping. Please refer to the Conditions & Regulations of Funding section for further guidance. Applicants will be judged against the following criteria: - Academic merit / degree qualifications; - Professional qualifications achieved, where relevant; - Strength of personal statement; - Applicant s future plans, and what they plan to do with the postgraduate taught degree; - Confirmation of other funds sought/secured, whether from other scholarships or family/self funds. Note that preference may be given to applicants who have already secured some partial funding from alternative sources towards the cost of the postgraduate taught degree programme; - Preference may be given to students who have not previously undertaken a postgraduate degree programme. Faculties will be asked to provide details of their selected candidate(s), together with a list of reserve candidates, by the end of May 2015 at the latest. Announcement of Results: All results will be announced via in the first instance. 7 Candidates who are deemed ineligible by the PGSS office for any of the Graduate School PGT funding schemes, as covered by the online PGT funding form, will be informed about their ineligibility within 3 weeks from the Graduate School application deadline. Eligible applicants who have been considered for the King s President s International Scholarships will be informed about the outcome of their application towards mid/end of May Candidates who are selected for the awards will be asked to provide a decision on acceptance/decline by a given deadline. If a successful candidate fails to respond by the given deadline or declines the offer, their award will automatically be transferred to a reserve candidate who is next in-line for the award. No further allocation or reallocation of awards should occur beyond the end of July 2015. 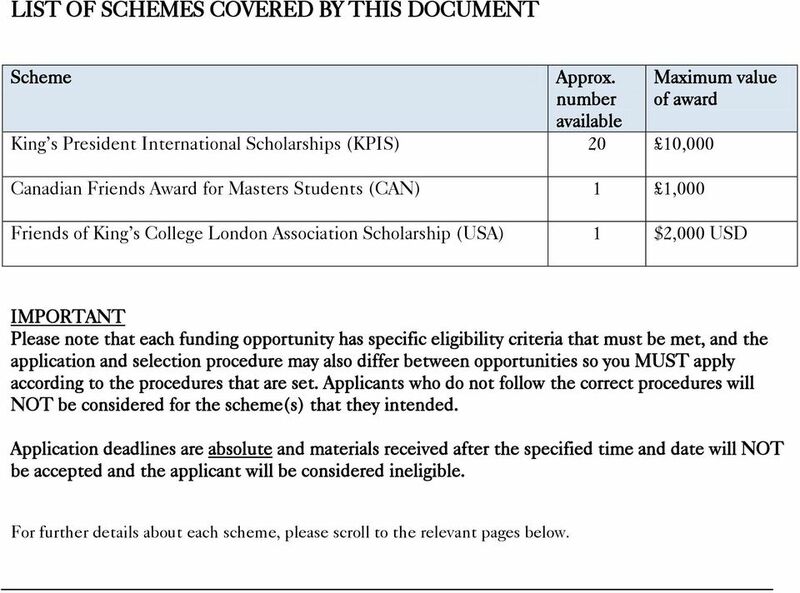 8 Canadian Friends Award for Masters Students (CAN) Eligibility Criteria Applicants MUST: Be due to commence a full-time postgraduate Masters programme at King s College London in the 2015/16 academic year; Be permanent residents of Canada at the time of application and be domiciled within Canada for the last 3 years, for purposes other than education; Be liable to pay tuition fees at the international/overseas (higher) rate; Complete and submit the required application documentation by the stated funding deadline (see below); Fulfil the relevant entry requirements set by King s College London. Please note that: Students who are already registered on the respective postgraduate programme are not eligible to apply; This award offers a one-off payment only; These studentships cannot be held on a part-time basis; Applicants are expected to possess/attain a first class or very good upper second class (2:1) honours degree for their undergraduate qualification; As the award provides partial funding only, applicants must be able to confirm that they have the means to support any outstanding fees/costs not covered by this scheme, i.e. through other funding awards or selffunding; The successful candidate will be required to submit a thank you letter to the donor for their generosity. Application Process: Application Start: 1 December 2014 Application Deadline: 17:00 GMT, 31 st March 2015 Applications will be invited from 1 December 2014 and will close on 31 st March 2015 at 17:00 GMT sharp. To be considered for the award, applicants MUST, by the application deadline of 17:00 GMT, 31 st March 2015: 1) Have submitted a complete online admissions application ( for a postgraduate Masters programme at King s College London. AND Admissions applications must be complete in order for an application to be considered for funding, and for an admissions application to be deemed complete it must contain all the relevant supporting documentation, such as references, transcripts, and English language scores. It will be the applicant s responsibility to ensure that all supporting materials are submitted to the College by the funding deadline of 31st March 2015, 17:00GMT. * 2) Submit a Graduate School PGT online funding form. Note that this online funding application form should only be completed once an admissions application has been submitted to the College. The online funding form can be accessed at: *Students who have already applied for admissions, and those who hold a place but deferred entry to 2015/16, will not be required to submit an admissions application again. 9 Failure to submit both application forms, as appropriate, by the application deadline will result in the application being ineligible. 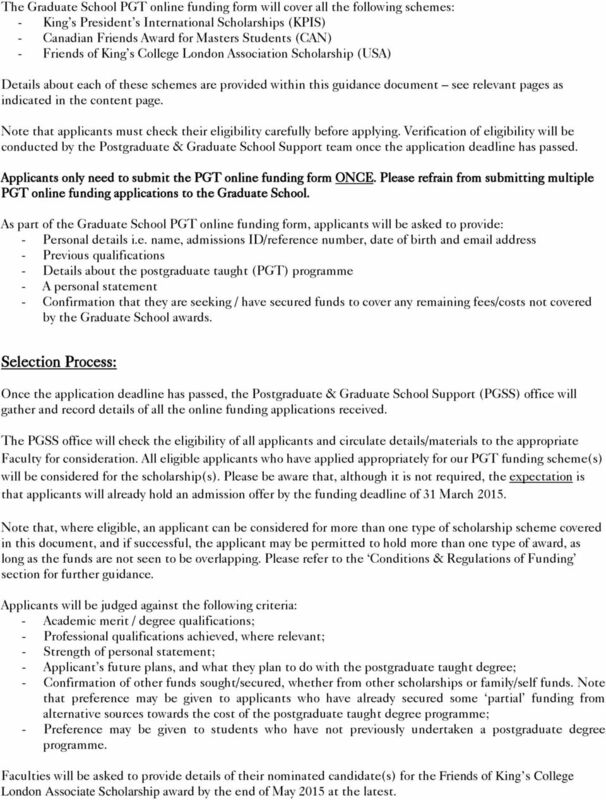 The Graduate School PGT online funding form will cover all the following schemes: - King s President s International Scholarships (KPIS) - Canadian Friends Award for Masters Students (CAN) - Friends of King s College London Association Scholarship (USA) Details about each of these schemes are provided within this guidance document see relevant pages as indicated in the content page. Note that applicants must check their eligibility carefully before applying. Verification of eligibility will be conducted by the Postgraduate & Graduate School Support team once the application deadline has passed. Applicants only need to submit the PGT online funding form ONCE. Please refrain from submitting multiple PGT online funding applications to the Graduate School. As part of the Graduate School PGT online funding form, applicants will be asked to provide: - Personal details i.e. 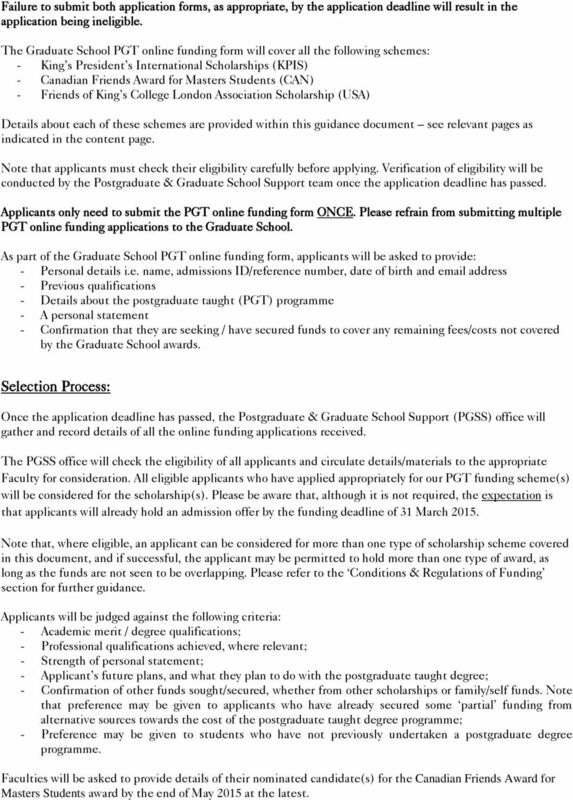 name, admissions ID/reference number, date of birth and address - Previous qualifications - Details about the postgraduate taught (PGT) programme - A personal statement - Confirmation that they are seeking / have secured funds to cover any remaining fees/costs not covered by the Graduate School awards. Selection Process: Once the application deadline has passed, the Postgraduate & Graduate School Support (PGSS) office will gather and record details of all the online funding applications received. The PGSS office will check the eligibility of all applicants and circulate details/materials to the appropriate Faculty for consideration. All eligible applicants who have applied appropriately for our PGT funding scheme(s) will be considered for the scholarship(s). Please be aware that, although it is not required, the expectation is that applicants will already hold an admission offer by the funding deadline of 31 March Note that, where eligible, an applicant can be considered for more than one type of scholarship scheme covered in this document, and if successful, the applicant may be permitted to hold more than one type of award, as long as the funds are not seen to be overlapping. Please refer to the Conditions & Regulations of Funding section for further guidance. Applicants will be judged against the following criteria: - Academic merit / degree qualifications; - Professional qualifications achieved, where relevant; - Strength of personal statement; - Applicant s future plans, and what they plan to do with the postgraduate taught degree; - Confirmation of other funds sought/secured, whether from other scholarships or family/self funds. Note that preference may be given to applicants who have already secured some partial funding from alternative sources towards the cost of the postgraduate taught degree programme; - Preference may be given to students who have not previously undertaken a postgraduate degree programme. 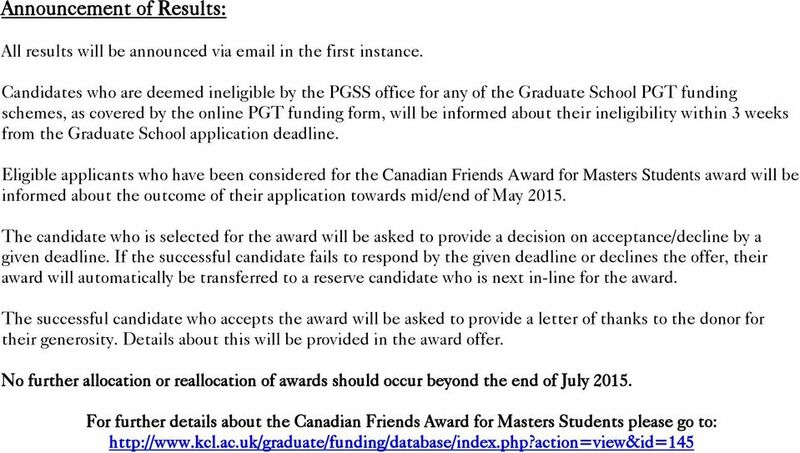 Faculties will be asked to provide details of their nominated candidate(s) for the Canadian Friends Award for Masters Students award by the end of May 2015 at the latest. 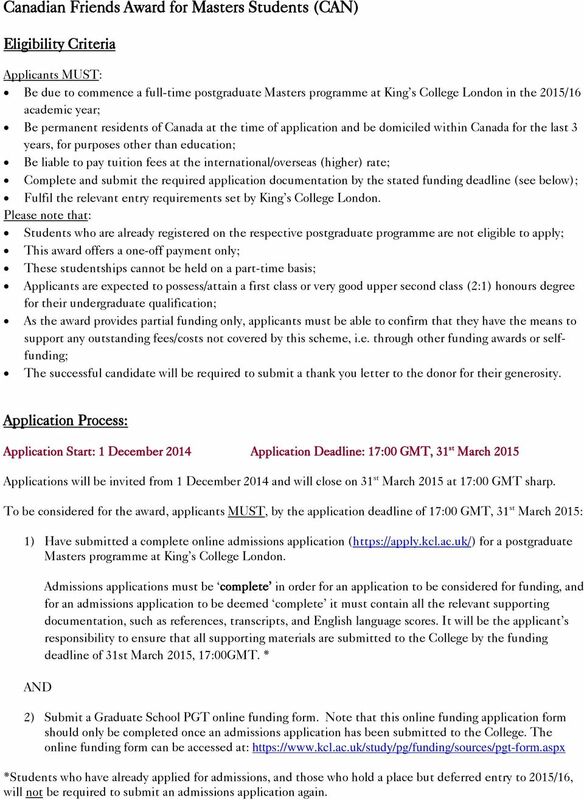 11 Friends of King s College London Associate Scholarship (USA) Eligibility Criteria Applicants MUST: Be due to commence a full-time postgraduate Masters programme at King s College London in the 2015/16 academic year; Be permanent residents of the USA at the time of application and be domiciled within the USA for the last 3 years, for purposes other than education; Be liable to pay tuition fees at the international/overseas (higher) rate; Complete and submit the required application documentation by the stated funding deadline (see below); Fulfil the relevant entry requirements set by King s College London. Please note that: Students who are already registered on the respective postgraduate programme are not eligible to apply; This award offers a one-off payment only; These studentships cannot be held on a part-time basis; Applicants are expected to possess/attain a first class or very good upper second class (2:1) honours degree for their undergraduate qualification; As the award provides partial funding only, applicants must be able to confirm that they have the means to support any outstanding fees/costs not covered by this scheme, i.e. through other funding awards or selffunding; The successful candidate will be required to submit a thank you letter to the donor for their generosity. 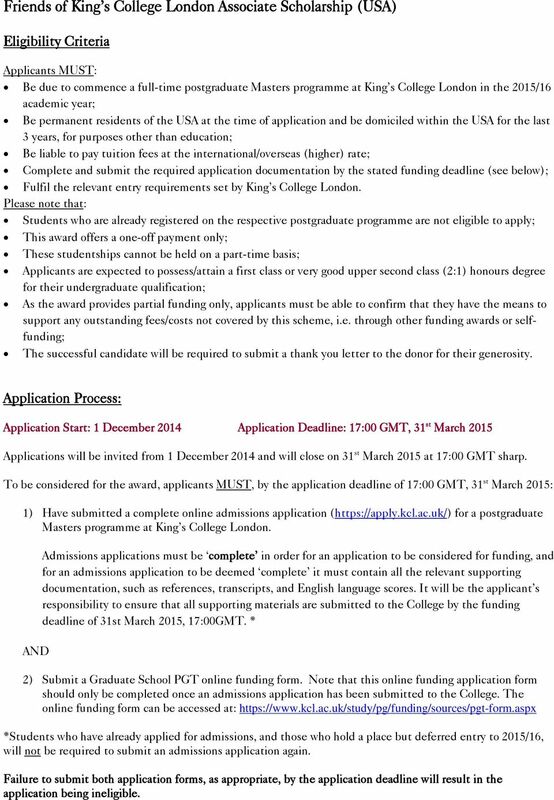 Application Process: Application Start: 1 December 2014 Application Deadline: 17:00 GMT, 31 st March 2015 Applications will be invited from 1 December 2014 and will close on 31 st March 2015 at 17:00 GMT sharp. To be considered for the award, applicants MUST, by the application deadline of 17:00 GMT, 31 st March 2015: 1) Have submitted a complete online admissions application ( for a postgraduate Masters programme at King s College London. AND Admissions applications must be complete in order for an application to be considered for funding, and for an admissions application to be deemed complete it must contain all the relevant supporting documentation, such as references, transcripts, and English language scores. It will be the applicant s responsibility to ensure that all supporting materials are submitted to the College by the funding deadline of 31st March 2015, 17:00GMT. * 2) Submit a Graduate School PGT online funding form. Note that this online funding application form should only be completed once an admissions application has been submitted to the College. The online funding form can be accessed at: *Students who have already applied for admissions, and those who hold a place but deferred entry to 2015/16, will not be required to submit an admissions application again. Failure to submit both application forms, as appropriate, by the application deadline will result in the application being ineligible. 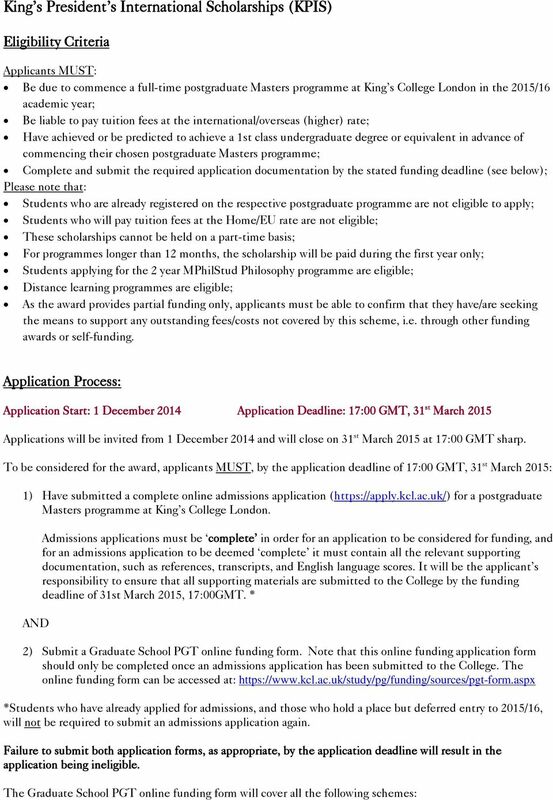 12 The Graduate School PGT online funding form will cover all the following schemes: - King s President s International Scholarships (KPIS) - Canadian Friends Award for Masters Students (CAN) - Friends of King s College London Association Scholarship (USA) Details about each of these schemes are provided within this guidance document see relevant pages as indicated in the content page. Note that applicants must check their eligibility carefully before applying. Verification of eligibility will be conducted by the Postgraduate & Graduate School Support team once the application deadline has passed. Applicants only need to submit the PGT online funding form ONCE. Please refrain from submitting multiple PGT online funding applications to the Graduate School. As part of the Graduate School PGT online funding form, applicants will be asked to provide: - Personal details i.e. name, admissions ID/reference number, date of birth and address - Previous qualifications - Details about the postgraduate taught (PGT) programme - A personal statement - Confirmation that they are seeking / have secured funds to cover any remaining fees/costs not covered by the Graduate School awards. Selection Process: Once the application deadline has passed, the Postgraduate & Graduate School Support (PGSS) office will gather and record details of all the online funding applications received. The PGSS office will check the eligibility of all applicants and circulate details/materials to the appropriate Faculty for consideration. All eligible applicants who have applied appropriately for our PGT funding scheme(s) will be considered for the scholarship(s). Please be aware that, although it is not required, the expectation is that applicants will already hold an admission offer by the funding deadline of 31 March Note that, where eligible, an applicant can be considered for more than one type of scholarship scheme covered in this document, and if successful, the applicant may be permitted to hold more than one type of award, as long as the funds are not seen to be overlapping. Please refer to the Conditions & Regulations of Funding section for further guidance. Applicants will be judged against the following criteria: - Academic merit / degree qualifications; - Professional qualifications achieved, where relevant; - Strength of personal statement; - Applicant s future plans, and what they plan to do with the postgraduate taught degree; - Confirmation of other funds sought/secured, whether from other scholarships or family/self funds. Note that preference may be given to applicants who have already secured some partial funding from alternative sources towards the cost of the postgraduate taught degree programme; - Preference may be given to students who have not previously undertaken a postgraduate degree programme. 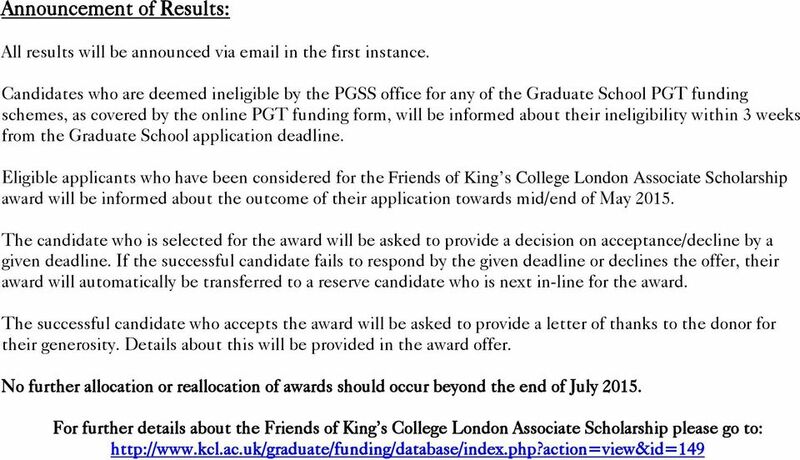 Faculties will be asked to provide details of their nominated candidate(s) for the Friends of King s College London Associate Scholarship award by the end of May 2015 at the latest. 14 CONDITIONS & REGULATIONS OF FUNDING CONDITIONS APPLICABLE TO ALL SCHEMES Awards are offered on the condition that the candidate has met/will meet all the conditions required for acceptance by his/her chosen School of study. Each award will be made on the assumption that there are adequate resources for the degree programme. New awards offered in 2015 are valid only to commence in the 2015/16 academic session; deferral of an award to a later academic session is not permitted. Awards are valid only at King s College London and cannot be transferred to another institution. If an award-holder wishes to make a change to: a) their programme, b) their mode of study or c) their department/division/school/institute, as specified on their application form, he/she must first seek approval from the Postgraduate & Graduate School Support team. Before a decision can be made, the award-holder would need to outline the changes proposed and provide confirmation of i) the department s/tutor s support of such changes, and ii) the tuition fees (if they are different from the amount attached to the original programme). Failure to inform the Postgraduate & Graduate School Support team of such a change may impact on the continuation of an award. If an award-holder needs to take time out from their studies due to illness, accident, fieldwork or for any other serious cause, they must report this as soon as possible to the relevant School Office/Academic/Record Centre to request an interruption of studies. The award-holder must also inform the Postgraduate & Graduate School Support team to request a temporary suspension of award funding. If the Postgraduate & Graduate School Support team is not informed and continues to pay for a student who is absent from their studies, a refund will be sought for overpayment, and it may also impact on the continuation of an award. 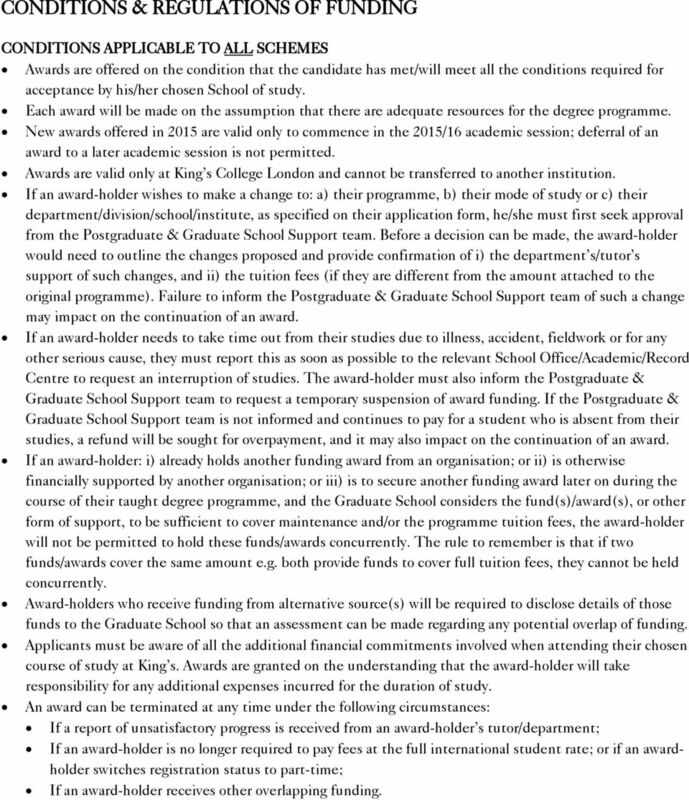 If an award-holder: i) already holds another funding award from an organisation; or ii) is otherwise financially supported by another organisation; or iii) is to secure another funding award later on during the course of their taught degree programme, and the Graduate School considers the fund(s)/award(s), or other form of support, to be sufficient to cover maintenance and/or the programme tuition fees, the award-holder will not be permitted to hold these funds/awards concurrently. The rule to remember is that if two funds/awards cover the same amount e.g. both provide funds to cover full tuition fees, they cannot be held concurrently. Award-holders who receive funding from alternative source(s) will be required to disclose details of those funds to the Graduate School so that an assessment can be made regarding any potential overlap of funding. Applicants must be aware of all the additional financial commitments involved when attending their chosen course of study at King s. Awards are granted on the understanding that the award-holder will take responsibility for any additional expenses incurred for the duration of study. An award can be terminated at any time under the following circumstances: If a report of unsatisfactory progress is received from an award-holder s tutor/department; If an award-holder is no longer required to pay fees at the full international student rate; or if an awardholder switches registration status to part-time; If an award-holder receives other overlapping funding. 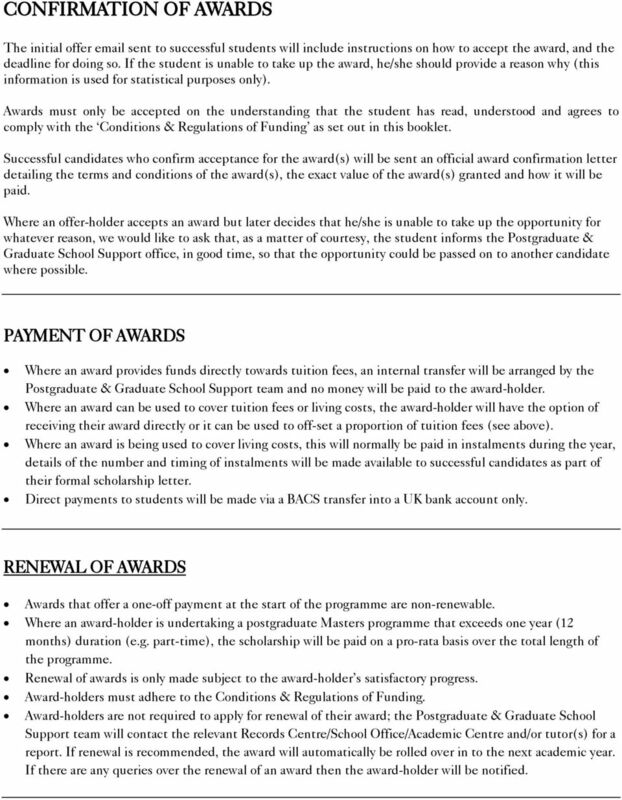 15 CONFIRMATION OF AWARDS The initial offer sent to successful students will include instructions on how to accept the award, and the deadline for doing so. If the student is unable to take up the award, he/she should provide a reason why (this information is used for statistical purposes only). Awards must only be accepted on the understanding that the student has read, understood and agrees to comply with the Conditions & Regulations of Funding as set out in this booklet. Successful candidates who confirm acceptance for the award(s) will be sent an official award confirmation letter detailing the terms and conditions of the award(s), the exact value of the award(s) granted and how it will be paid. Where an offer-holder accepts an award but later decides that he/she is unable to take up the opportunity for whatever reason, we would like to ask that, as a matter of courtesy, the student informs the Postgraduate & Graduate School Support office, in good time, so that the opportunity could be passed on to another candidate where possible. PAYMENT OF AWARDS Where an award provides funds directly towards tuition fees, an internal transfer will be arranged by the Postgraduate & Graduate School Support team and no money will be paid to the award-holder. Where an award can be used to cover tuition fees or living costs, the award-holder will have the option of receiving their award directly or it can be used to off-set a proportion of tuition fees (see above). Where an award is being used to cover living costs, this will normally be paid in instalments during the year, details of the number and timing of instalments will be made available to successful candidates as part of their formal scholarship letter. Direct payments to students will be made via a BACS transfer into a UK bank account only. RENEWAL OF AWARDS Awards that offer a one-off payment at the start of the programme are non-renewable. Where an award-holder is undertaking a postgraduate Masters programme that exceeds one year (12 months) duration (e.g. part-time), the scholarship will be paid on a pro-rata basis over the total length of the programme. Renewal of awards is only made subject to the award-holder s satisfactory progress. Award-holders must adhere to the Conditions & Regulations of Funding. Award-holders are not required to apply for renewal of their award; the Postgraduate & Graduate School Support team will contact the relevant Records Centre/School Office/Academic Centre and/or tutor(s) for a report. If renewal is recommended, the award will automatically be rolled over in to the next academic year. If there are any queries over the renewal of an award then the award-holder will be notified. Work with your prospective supervisors to complete your application. Master of Science in Sustainability, Development and Peace United Nations University Institute for Sustainability and Peace Application Guide Instructions to Applicants for 2013 Admissions Contents 1.